All the dark green checkerboard units for the next Lincoln block have been completed along with the two long rectangle checkerboards of dark purple. I know that it appears black in the photo, but it really is dark purple. It was the right decision to make all the checkerboard units for the remaining three Lincoln blocks. 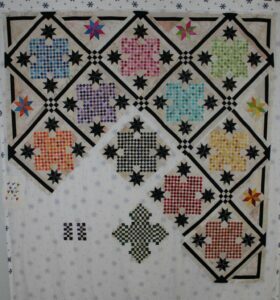 The design wall is starting to give me a good idea of the finished quilt center. 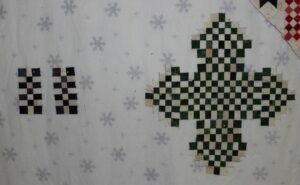 The plan is to have the remaining five units of the dark purple finished this week, then it will be time to sew the golden yellow checkerboards for the last block.